No compensation was received for this post. A complimentary review copy was provided so that I could read the book and share my thoughts. All opinions expressed are my own or that of my family. Last summer I read my first Denise Hunter book, Barefoot Summer, and really enjoyed it. So, when I had a chance to read another book by Denise Hunter from the same Chapel Springs Romance series, I jumped at it. 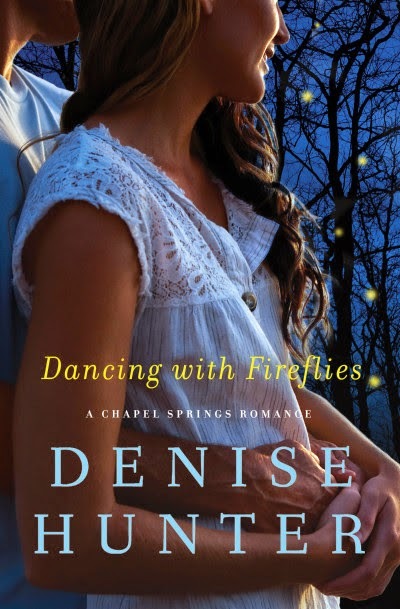 Dancing With Fireflies follows the story of Jade McKinley and Daniel Dawson, a long-time honorary member of the McKinley family. It includes many of the characters from the first story in the series, which is a nice way to continue to follow their story. Jade has faced many challenges in her love life and those challenges have left her afraid to love and when faced with the potential of love frightens her away. It takes a major incident to force her to set aside those fears and allow her true feelings to flow. I really liked the style in which the story was written. The focus on character development is around the two primary characters, with those around them developed mostly to help further define the main characters. The book jumps right into the story, using reflection and conversations to help the reader 'catch up' on the background, history and the different relationships. This occurs not just in the opening chapters, but throughout the story. Even though this is the second book in the series, there is no need to have read the first book to understand the second. At the same time, it doesn't rehash the first story in the series either. The characters are well developed and easy to love. They are the type of people that I would want for friends. I love how their relationship evolves almost without Jade realizing it. As an outsider, it certainly seems obvious how each feels and Daniel certainly knows what his feelings are but Jade slowly comes to realize the love is more than that of a sibling or friend. This helps make it feel more real and the story more believable. I really enjoyed reading this book and was able to read it in a relatively short window. I read it in only a couple of days...I would have been done sooner, but as a mom, I do have actual responsibilities that tore me away from the story. I would recommend Dancing With Fireflies to anyone looking for a enjoyable, love story. Love stories are always fun to read.